There will be water on the course and snacks back at the start/finish. Feel free to bring a snack if ya got one. Fan-favorite Mike Edwards will be leading this run. Listen to him, he’ll explain everything. Do what he says (within reason). Cost: Slide us a $5 bill or some loose change from under your couch cushions. OK, side note, these course preview runs are brought to you by MyMuddyShoes, the local trail tribe here in Montgomery County, in conjunction with the Stone Mill 50 Race Directors – all rise – Barry Hauptmann and John Fitz! You may be seated. Anyway we run every Tuesday (in the dark) every Thursday (in the dark) and every Saturday when MCRRC Winter Trails is not in session. 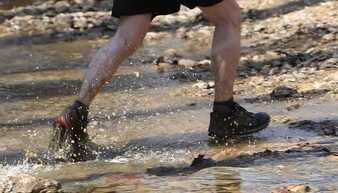 Check us out on Facebook, Yahoo or at www.mymuddyshoes.org . OK, that’s it! Be there or be square.